"As the barriers of a typical classroom come tumbling down, students are better able to connect their learning to practical, real-world applications outside of the classroom." Accomplished and dedicated faculty members foster the spiritual development, individual talents and interests of each student. This is realized through rigorous and comprehensive academic, arts, athletics, service and global programs. Holy Child graduates are prepared for the innovative and critical thought necessary in a diverse, interconnected society. 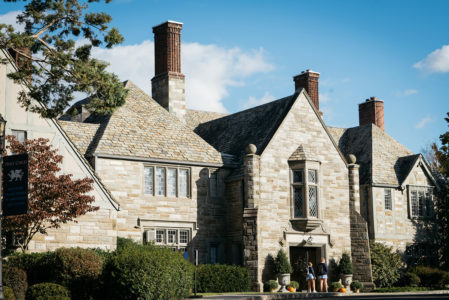 Founded in 1904 by the Society of the Holy Child Jesus, Holy Child was originally located in New York City, and moved to its present location in Rye in 1957. The best way to learn more about Holy Child is by scheduling time to visit our campus. Meet our teachers, speak with our students and see our classrooms in action! This will help you discover why Holy Child is the best school for girls, and for your family. Address: 2225 Westchester Avenue, Rye, NY 10580. Although I am sad that my time at Holy Child is almost over, I know that I will be a more enthusiastic and dynamic learner because of my experiences here. Since my first day of sixth grade, Holy Child has taught me the value of a strong community and how to learn." The experience I had attending school at Holy Child is life lasting. I have always worked hard and enjoyed philanthropy and Holy Child encouraged my strengths. I currently own 3 companies in Westchester and am on the board of Directors of a no kill animal shelter. I married my high school sweetheart (met while at Holy Child) and have 2 daughters. My oldest daughter will now attend this school and I couldn't be more proud of her. I look forward to watching her grow into a strong, compassionate, independent woman with the guidance of Holy Child. My days as a Holy Child student were fundamental in the most positive way into making me who I am. My love for science started and grew because of my rigorous yet balanced Holy Child education by teachers who really cared. Plus, I cherish my lifetime of many close friendships nurtured during my years at Holy Child. I'd do it all again in a heartbeat, especially because of the unique programs being offered such as E.E. Ford program for engineering, architecture and design.